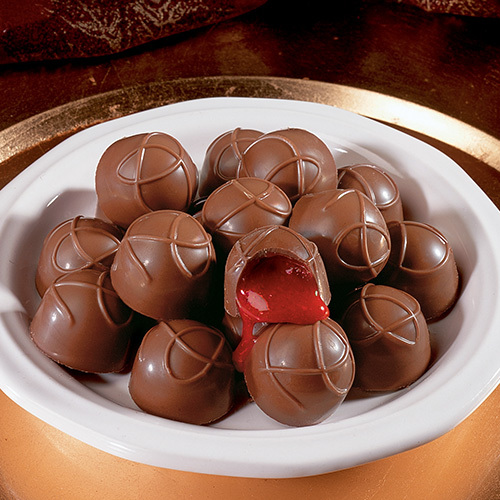 Exquisite milk chocolate shapes filled with flowing cherry fondant and real cherry bits. 6 oz. box. MILK CHOCOLATE (SUGAR, WHOLE MILK, COCOA BUTTER, CHOCOLATE LIQUOR, SOY LECITHIN [EMULSIFIER],SALT, VANILLIN [ARTIFICIAL FLAVOR]), SUGAR, CHERRIES, WATER, CORN SYRUP, HIGH FRUCTOSE CORN SYRUP, SORBITOL, NATURAL FLAVORING, CITRIC ACID, POTASSIUM SORBATE (PRESERVATIVE), RED 40. 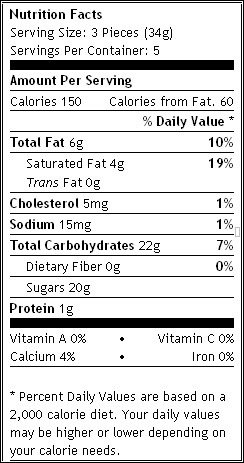 CONTAINS: MILK, SOY. MANUFACTURED ON SHARED EQUIPMENT, MAY CONTAIN EGG, PEANUTS AND TREE NUTS.